I was so excited when Quilt Con was first announced because the chance to take a lot of classes was super exciting...until I saw the price. Classes alone would have been over $500, if I took every class that I wanted, so I had to really think about what I wanted and just pick one! After a good 5 minutes, I decided on Free Motion Quilting on your Home Machine with Elizabeth Hartman. Her style is something that I have always admired and her books have taught me a lot. Throw in the mix that I have only FMQ’d one quilt and it was perfect timing for what I am ready to learn now. Elizabeth was a great teacher and I learned more about pin basting as opposed to spray basting. It wasn't nearly as bad as I thought (well except the part about how you really do have to crawl on the floor to do it). 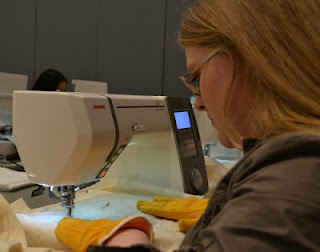 She offered tips on needles, thread, techniques, and we talked about quilting with the pedal and without. She would show us 4 or 5 designs, suggested we would doodle them first and then go to work on just doing it! One thing that makes her such a strong teacher is her style. As we were practicing she was walking between the 20 students and answered questions as they came up, which was appreciated by all of us. 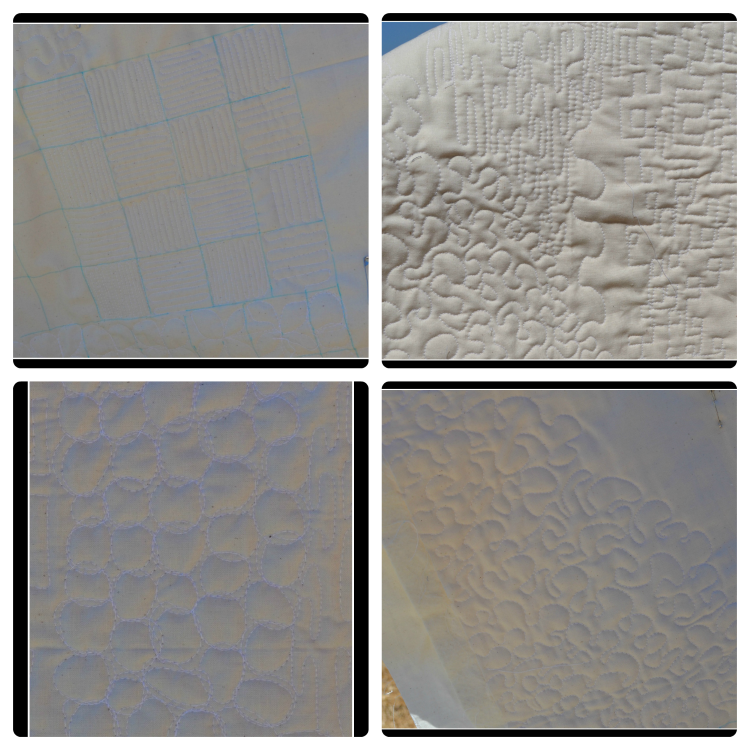 Here are some glimpses of my practice (and I'm sorry the lighting isn't good on all of them). The pattern that was the hardest for me to do was the meander and that is one that looked the easiest. 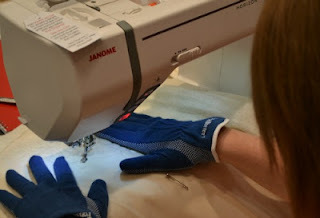 Everyone that comments about FMQ says practice practice practice, so that is how I intend to get better. Speaking of practice, enjoy a couple of shots of us practicing! 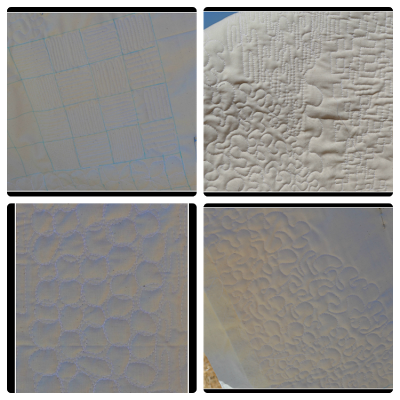 I almost quilted swirls on my Scrappy Trip Around the World and then I chickened out. See, Julie... You don't have to crawl around on the floor to pin baste. Lol! Great free motion samples. Glad to hear you enjoyed the class. Now it just takes practice and relax.